Shock technology has been rapidly evolving, and with each new innovation we reap the rewards with improved control and comfort. Now Polaris, in partnership with FOX the leader off-road shock technology, is about the change everything you thought you knew about shock performance with the all-new 2018 RZR Dynamix. Just what the heck is Dynamix you ask? Other than a cute play on words, it is the name given to the new electronically controlled damping system that delivers shock valving control at your fingertips. We knew the technology existed, and in fact it has been in use to varying degrees for the better part of 25-plus years and has been used in mountain bikes, off-road race vehicles, and even snowmobiles. The new Dynamix system is a two-fold system. First the on-board computer measures 7 vehicle inputs at a rate of 200-times per second and then makes on-the-fly adjustments to the FOX Live Valve shocks. Measurements include vehicle speed, brake pedal position, throttle pedal position, steering inputs, accelerometer readings, gyroscope readings, and the mode switch. Ahh, you caught that last part. Yes, the new RZR Dyanmix has a mode switch, allowing users to select from one of three ride calibrations: firm for maximum damping, sport for general all-around ride control, and comfort for the softest ride possible. Within each of these modes the Dynamix system further controls the valving of each of the shocks independently. With each shock having independent control, the capabilities of the system have mind blowing potential. Charge hard into a corner and the system detects vehicle roll and automatically firms the damping of the outside shocks, thereby reducing body roll and giving you flatter cornering and better control. Launch the RZR off a dune or on-the-trail kicker jump and the system suddenly realizes the vehicle is airborne. Knowing this along with the attitude of the vehicle,it prepares the shocks for impact, delivering stiffer calibrations to the front, rear, or all four corners, depending upon how the vehicle will land. Even acceleration is improved according to Polaris. Thanks to throttle, accelerometer, and gyroscope sensors, Dynamix knows you’re hard on the gas and stiffens the rear shocks to deliver improved traction. 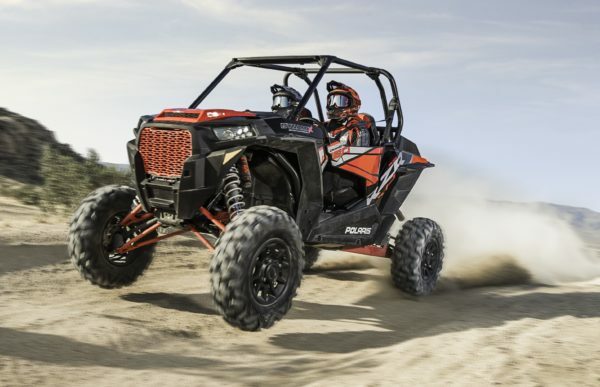 Yes, on paper the Dynamix RZR appears to be the proverbial game changer in the battle of off-road supremacy in the side-by-side category. How it actually performs is yet to be discovered as ATV World is traveling to Las Vegas this week to get behind the wheel and find out for ourselves. Stay tuned. A mode switch allows users to select one of three valving modes: firm, sport, and comfort. On screen diagnostics illustrate how the system is making on-the-fly adjustments. Under hard cornering the outside shocks become stiffer to prevent body roll resulting in flatter cornering. Under acceleration the rear shocks become firmer, putting more power to the ground.